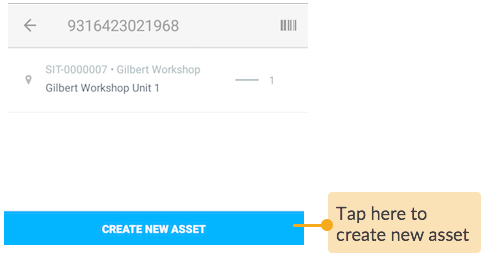 When creating a new asset, its asset type must be already created in Loc8 via the web browser. 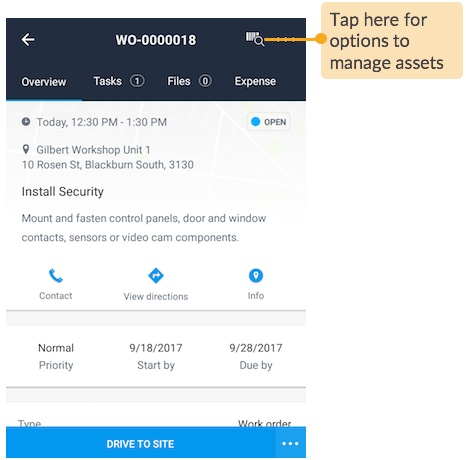 If you do not have permissions to access Loc8 on browser, your office staff should be able to set up the asset type for you by following the article Create Asset Type. 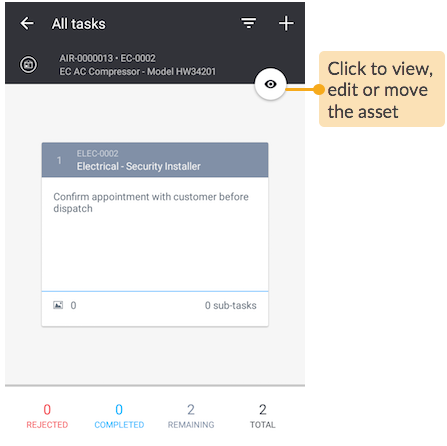 Record a new asset in Loc8, followed by creating a task for the new asset. 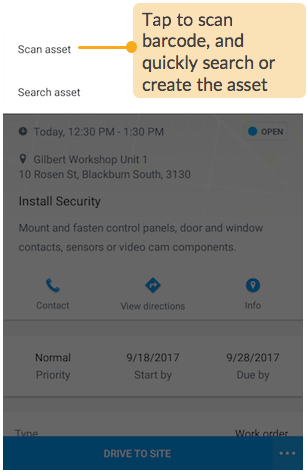 The Scan asset option turns on the camera on your mobile device. Focus and hold on the barcode. Once the code is captured, its corresponding asset is displayed. If you are scanning a new asset, see Create asset to add into Loc8. As an alternative to scanning the barcode of an asset, you can also look up an asset from a list that has already been recorded in Loc8. 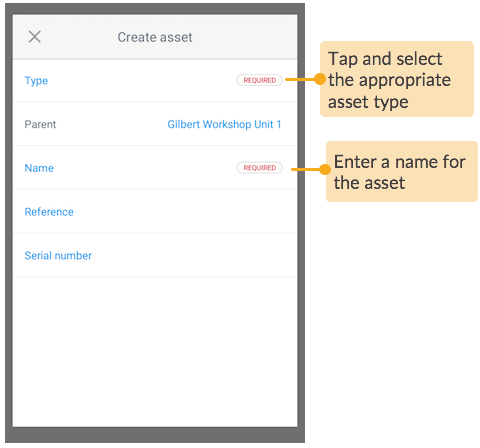 If the asset you are searching for is not yet added in Loc8, you can add the asset yourself as explained in Create asset. 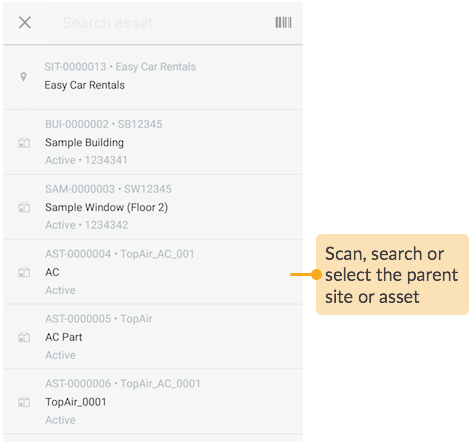 You can create a new asset in Loc8 using either the Scan asset or the Search asset option. 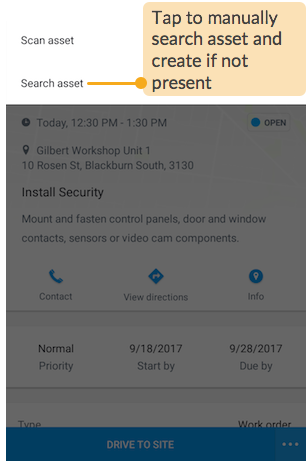 In the New asset window, fill in the asset details and save. NOTE: As mentioned in Prerequisite, the asset type to which the new asset belongs to must have been created in Loc8 via the web browser. 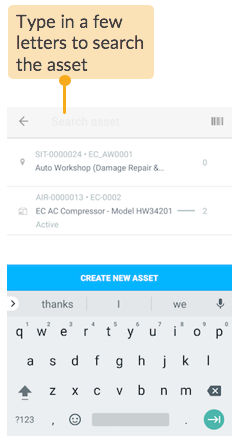 Once you have filled in the new asset details, click the tick icon on the top-right corner of your mobile screen. 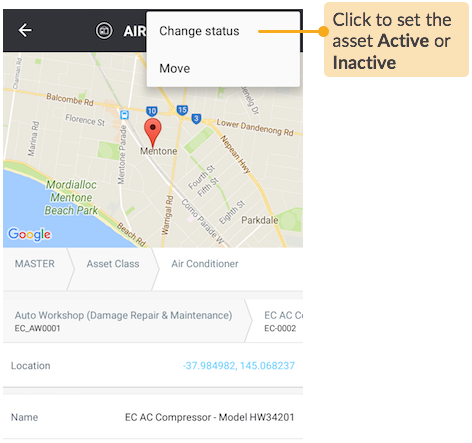 You can update the status of an asset to represent its actual physical state. 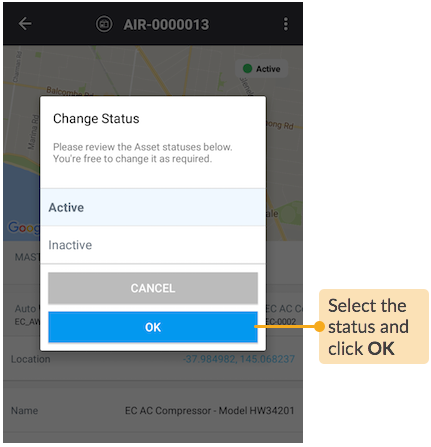 For example, if an asset is currently operating, its status would be Active, and when it is out of order, the status would be changed to Inactive. 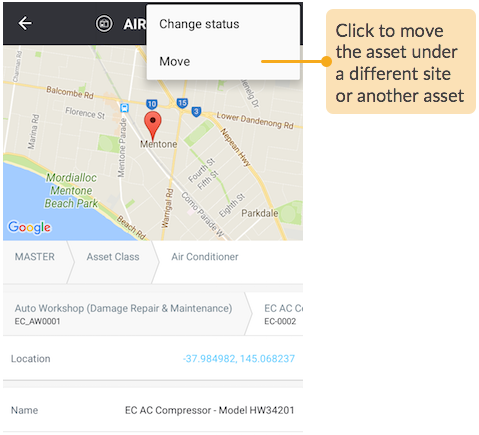 If an asset has been physically moved across locations or is now a subcomponent of another asset, you can easily update the asset associations in Loc8 by moving the asset under the new parent site or asset. Tap YES to confirm the relocation of the asset. 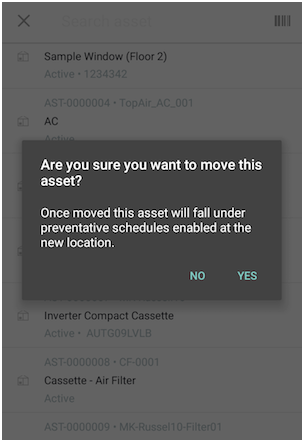 As informed by the message, if a maintenance schedule exists for the asset type to which this particular asset belongs to, and that schedule is active in the parent site, then the same schedule will automatically apply on the relocated asset.